Dear believers with hope: grace, mercy, and peace to you from God the Father and our Lord and Saviour Jesus Christ. Amen. Simeon lived in dark days. The land of Israel was occupied by Roman armies. The ruler at the time, Herod the Great, was a tyrant. He is the same Herod that ordered the Massacre of the Innocents in Bethlehem. The church had become corrupted by greed and power-hungry leaders. Teaching had wandered from Scripture as the Pharisees threw away the Ten Commandments and made up their own laws for people to follow. God had not sent a prophet for four hundred years, and from all appearances, God had abandoned His people because they had turned away from Him. Appearances can be deceiving, because God had not abandoned His people. There was a period of silence, but then an angel had appeared to Zechariah in the temple, and Zechariah had prophesied in the temple about his son John, and about the visitation of God to redeem His people. Angels appeared to shepherds, announcing the birth of the Saviour, and Simeon had been told that he would not die before he had seen the Lord’s Christ. In the midst of darkness, there was light. There was hope. God is faithful to His people even when they are faithless. Christ is born! Let heaven and earth rejoice! Simeon rejoiced. The world and the church were in a terrible state, but Simeon rejoiced because the Saviour was born. Simeon prophesied of the fall of many, the opposition to the Christ, and a sword piercing the soul of Mary, yet he rejoiced because Jesus was born to save us from falling, save us from opposition, and save us from sorrow and sin. Appearances can be deceiving, because all Simeon saw was an infant in His poor mother’s arms. But he believed God’s promise that this infant is the Saviour of the world. He believed and says that he is now ready to die in peace. Anna also lived in those dark days. In addition to the sadness of the state of the world and the church, she had sadness in her own life, too. She was only married to her husband for seven years when he died. At eighty-four, she had lived many years as a widow. She too gives thanks to God upon seeing the infant Jesus at the temple. In her excitement, she tells others at the temple who this baby is, this long-awaited Saviour. She does not say it, but she too was ready to die in peace, as Simeon’s song says. There is a reason we sing Simeon’s words right after receiving the body and blood of Christ in the Sacrament of the Altar. We too can depart in peace since God has fulfilled His Word. Our eyes see the salvation of God that He has prepared before the face of all people. Appearances here too can be deceiving, as all we see is bread and wine. But believing God’s Word and His promise that with the bread and wine we receive the true body and blood of Jesus for the forgiveness of sins, we too can be ready to die in peace. We live in dark days. The world and the church are in a terrible state. In the midst of darkness, however, there is light. There is hope. God is faithful to His people even when they are faithless. Christ was born to die and save us from our sin. He gives us forgiveness with His body and blood so we are ready to die; we are ready to leave this vale of tears to the eternal joys of Paradise because Christ has opened the kingdom of heaven for us. Simeon’s prophecy is part joyful, part sorrowful. There is joy because God has fulfilled His promise to send a Saviour as foretold by the prophets for thousands of years. Christ did not come just for the people of Israel, but He is a light for revelation to the Gentiles. He came for the whole world, to save us all. Christ came to reconcile man with God, and also to reconcile man with man. All war and division will cease. There is also sorrow. Simeon says to Mary, “Behold, this child is appointed for the fall and rising of many in Israel, and for a sign that is opposed (and a sword will pierce through your own soul also), so that thoughts from many hearts may be revealed.” Here is revealed that what is good for us is terrible for this infant. He will be opposed and spoken against. He will cause division. He will suffer and die, which will also bring suffering to His mother and His followers. But the sorrow and horror of Christ’s suffering and death is also His glorification. In His self-sacrifice He shows us the love of God for us, fallen mankind. Jesus’ death is how we know God’s love for us. We don’t have to wonder if God has abandoned us because of our sin. We don’t have to fear even in dark times. The world and the church may be in dark times, but God is faithful to His people even when they are faithless. He does not abandon us because of our sin. Instead, He forgives our sin. He forgives our sin, so we are ready to depart in peace. Then, we are bold and eager for the end, as Simeon was. Christ’s sorrow has brought us joy, both now and in eternity, so we pray with Simeon, “Lord, now you are letting your servant depart in peace.” Amen. Dear people in the light of Christ: grace, mercy, and peace to you from God the Father and our Lord and Saviour Jesus Christ. Amen. Our Gospel lesson for Christmas Day is the most important of the Christmas accounts for knowing who Jesus is. It most clearly teaches that Jesus is not just man, but that He is divine; that He is God. If everything that was created by God was created through Christ, who is the Word, then that means that Christ is not created. Christ must precede everything that was created. Christ therefore is eternal without beginning. Nothing exists apart from God and what God has created. If Christ is not created, He is therefore God. Then John tells us, “And the Word was with God.” This was in the beginning, before creation. There was nothing outside of God, so of course the Word was with God. Again, this is the same that Moses writes. When he writes, “God said, ‘Let there be light’” it shows that whenever God speaks, the Word must be with Him. The Word was with God, a separate person, but also God. Therefore John continues, in order to be as explicit and clear as possible, “And the Word was God.” There is no doubt therefore that Jesus is very God of very God as we confess in the Nicene Creed. Second, our Christmas Gospel tells us concerning the Word, “In Him was life.” Of course, you cannot create life unless you are the source of life. Apart from the Word, nothing is alive. All things that are alive are alive through the Word. This is also true of eternal life. Jesus says, “I am the resurrection and the life.” (John 11:25) There is no resurrection without the Word. There is no eternal life without the Word. Only the Word made flesh can give eternal life because only He died to earn you eternal life, and only He conquered death by rising from the dead Himself. Only the Word made flesh can give eternal life because He is the source, the cause, the fountain of life. Without Christ, man is in complete spiritual darkness. He may imagine that he is pleasing God in his life. He may think that his ways are right. He may think that he clings to what is life, but because he is in darkness, he really clings to death. All who trust in Christ for salvation, however, are in the light and have life. Even though our body will die, our soul will live forever and never die. This is what Jesus promises when He says, “I am the resurrection and the life. Whoever believes in me, though he die, yet shall he live, and everyone who lives and believes in me shall never die.” (John 11:25-26) “Though he die, yet shall he live” sounds like a contradiction if you don’t know what He means. It is no contradiction. Whoever believes in Christ has eternal life even when his body dies. The body is buried and awaits the day of resurrection, but the soul returns to its maker in Paradise, and is alive. Christ died as a man and His body was buried. Yet His spirit lived on because He is Life. Life could not and cannot die. Consequently, death was overcome and was swallowed up by life, so much so that His body soon again became alive. This same Life is the light of men. He who recognizes and believes in such a life in Christ, indeed passes through death, yet never dies. Christ, who is our Life protects him, so that death cannot harm him. Although the body must die and decay, the soul will not feel this death because believers are in the light of Christ, who is Life. On the day of resurrection his body will be raised imperishable and reunited with the soul. He who does not believe this, remains in darkness and death. Such a soul will taste and feel death, and will die eternally. On the day of resurrection, his body will be raised from the grave and both body and soul will suffer eternally for rejecting Christ who is the Life. Christ is your life. The soul of all who believe will never taste death because Jesus tasted death for you. The eternal Word who created you, came to earth to save you. God became man to deliver man. He is your light. He is your life. The darkness of this world cannot overcome the light of Christ. Death cannot overcome Christ, who is the Life. The Word who created you will protect your soul from death and raise your body on the Last Day. He is God, so you know that He keeps His promises and can do what He says He will do. He is eternal, and in Him, you too will live forever. May these blessed and comforting words of the Gospel strengthen you at this Christmas time. Jesus is the resurrection and the life. Whoever believes in Him, though he die, yet shall he live, and everyone who lives and believes in Him shall never die. Amen. Dear people who celebrate Christmas: grace, mercy, and peace to you from God the Father and our Lord and Saviour Jesus Christ. Amen. The devil wants us to celebrate Christmas. He wants us to get together with family and eat and drink and be merry. He wants us to put on pageants and shows, to give and receive presents, to put up all kinds of decorations, and even sing some of the popular Christmas carols. The busier we are with celebrating Christmas in these ways, the more we will miss Christmas entirely. Christmas is not about family. Christmas is not about presents. Christmas is not about eating and drinking. Christmas is about God taking on human flesh to live and die for us because of our sin. More often than not, it seems like Christ is the least important part of Christmas. That is exactly the kind of celebrating the devil wants. The devil wants you to celebrate Christmas so long as you are distracted from knowing who Christ is, why He came, or what fruit He produces in us. The reason why Christ has become a less and less important part of Christmas, is that He has become a less and less important part of life in general. Christ is treated as a sort of side dish to the great feast of our lives, or He is treated like the turkey in a Christmas meal: you kind of think He should be part of the meal, but only if smothered in lots of gravy, dressing, cranberry sauce, and followed by a sip of white wine to wash it down. Christ loses importance to those who forget the ancient curse of sin that has doomed to death the whole universe. We can see this curse all around us in sickness, death, lies, slander, gossip, discontentment, violence, natural disasters, and so on. Everything that is wrong in the world is because of us and our sin, yet in our stupidity, we are more likely to point the finger at God for everything that is wrong. The coming of God in the flesh at Christmas was to fix everything that is wrong. Christ came to take the ancient curse of sin onto Himself. He took the sin of everyone from Adam to you and your children and grandchildren and great grandchildren. Christ did this through His suffering and death. It is written, “Cursed is everyone who is hanged on a tree.” Thus, Christ, by His crucifixion on the cross redeemed us from the curse by becoming a curse for us (Gal. 3:13, cf. Deut. 23:23). He redeemed us from sin, which means that He freed us from the slavery of sin and the curse of eternal death that is the due punishment of sin. Christ came to save us from hell and to bring us into the new heavens and the new earth which are perfect and without sin or blemish. He came to save us from this world of suffering and death to Paradise, where there is neither. To show how unimportant are all the celebrations and feasting and all the other stuff we tend to hold dear, Christ shows us that He cares nothing for it. He came in poverty and humility so that we would understand what is truly important. Christ chose to be born to a young woman in a working class family. He chose to be born at a time when the governing authorities were forcing everyone to go to their hometowns to be registered for taxing purposes, and Mary and Joseph were forced to leave their home for a long journey right when Mary was about to give birth. Christ shows how He cares nothing for the luxuries of this world, as He was born in a lowly manger because there was no room anywhere else for them. Mary did not even have the customary preparations and help other women would have at such a time. This is the first picture with which Christ puts the world to shame. Christ makes way for others. Others fill the houses and apartments, the inns and hotels. They feast in them. They eat, drink, and are merry. Many a wicked man sat as head of table being honoured as lord, while the the creator of the universe, the God of heaven and earth lies in an animal feeding trough. Doth come to serve the sinner in great meekness. Christ does this to show you what is important. We have heard who Christ is and why He came, this is where we get to the fruit that He produces in us. Christ is God in the flesh, who came to save us from our sin and show us how unimportant are all the things that the world holds dear. The fruit that this bears in us is that we cling to Christ in faith instead of clinging to what the world holds dear. This does not mean that we don’t have feasts or that we don’t get together with family. It doesn’t mean that we refuse to put up decorations or don’t give presents. It means that we cling to Christ and what He has done as of the greatest importance; that we would be willing to give up and lose all these other things rather than lose Christ. Who Christ is and why He came also produce the fruit in us that we seek more and more to follow His example of making way for others. Of giving to others. Of not seeking our own good, but the good of others. When Christ changes our hearts so that we don’t cling to the things of this world, He gives us generous hearts to help those who are in need with the things of this world. This is not what the devil wants you to hear at Christmas, and it’s not what he wants you to do. But not even he can change who Christ is or undo what Christ has done, and not even he can take your heart away from Christ no matter what worldly things he tempts you with. But thou, my heart, keep Christ as thy true treasure. A crown be thine and honour in full measure. (LSB 372 st. 6) Amen. Dear hearers of the voice crying in the wilderness: grace, mercy, and peace to you from God the Father and our Lord and Saviour Jesus Christ. Amen. John the Baptist confessed, and did not deny, but confessed that he is not the Christ, that he is not the Elijah the Jews expected, nor is he the prophet foretold by Moses of Whom we heard in our Old Testament lesson. For four hundred years, God had sent them no prophets. The last prophet, Malachi, had foretold of the coming of Elijah the prophet before the great and awesome day of the Lord (Mal. 4:5). The angel Gabriel says that John will go before the Christ in the spirit and power of Elijah (Luke 1:17), and Jesus confirms that John is Elijah who is to come (Matt. 11:14; 17:11-13). John was not, however, the falsely interpreted Elijah the Jews were expecting, and thus he denies being that Elijah. Neither was John the the prophet foretold by Moses. The prophet foretold by Moses is none other than Jesus Himself. John rather quotes this prophecy concerning himself, “I am the voice of one crying out in the wilderness, ‘Make straight the way of the Lord,’ as the prophet Isaiah said.” He is different from all the other prophets. He was not pointing forward in time to the future coming of the Christ. He was pointing to Jesus who was there present, standing among them, and saying, “Behold, the Lamb of God, who takes away the sin of the world.” He was not a prophet who gathered people to teach them and advise them, but he gathered them to bring them to Jesus, who was there present. He was the forerunner, running directly in front of the Lord of all prophets, telling people to step aside and make room. John preached, “Make straight the way of the Lord!” This must mean that the way of the Lord was not yet straight among them. They were crooked. They had neither the Lord nor His ways. Where the Lord is not, nor His way, there is only man’s way, the world’s way, the devil’s way. This was John’s preparation of the Lord’s way. He was to humble the whole world and to proclaim that they are all sinners – lost, damned, poor, miserable, pitiable people. He was to tell them that all their works are nothing but sin and they all deserve eternal punishment in hell and can only be saved by the grace and mercy of the One whose way he was preparing. This humbling is necessary, for whoever is full of himself has no room for Jesus. This therefore John preached to prepare the way of the Lord, telling everyone to give way and make room. There are two responses to the preaching of John. Some confess that his preaching is true, that they are sinful. These are the people to whom the Lord comes. In them His way is prepared and made even. As Scripture teaches, God gives grace to the humble (I Pet.5:5), and the one who humbles himself will be exalted (Luke 18:14). The other hearers deny John’s preaching. They see their way as being straight. They think that they do enough good in the community and are generous enough in helping the needy that they are not poor, miserable, or deserving of hell. They say they are not sick, and thus have no need of a physician. They think John and his preaching are crooked. Such hearers cannot endure such preaching. No wonder John had to be put to death, and His Master after him. Having heard John’s answer that he is not the Christ, he is not Elijah, and neither is he the Prophet, those sent by the Pharisees ask, “Then why are you baptizing?” Who do you think you are? We are the rulers and leaders of the church. We are your superiors according to the Law of Moses and you have to answer to us. You can’t go off on your own and do your own thing without our knowledge and permission. Here they reveal their hypocrisy. The Pharisees did not send the priests and Levites to ask who John is so they could hear his preaching, learn from him, and be baptized by him. They went to him to tell him to stop doing what he’s doing, no matter who he thinks he is. Really, that could be recognized from the outset, because the Pharisees didn’t go themselves to hear John preach or be baptized by him. They sent their goons. If they had actually believed that John was the Christ, Elijah, or the Prophet, they would have come themselves to hear him preach and be baptized by him, as others did. But John is no reed shaken by the wind. Neither their hypocritical flattery nor their threats deter him. He responded, “I baptize with water, but among you stands one you do not know, even He who comes after me, the strap of whose sandal I am not worthy to untie.” He may not have had authority from the Pharisees to baptize with water, but he had authority from the One whose way he prepared. The Pharisees didn’t know Him, otherwise, instead of questioning from where John had authority to baptize, they would have come themselves to be baptized. They did not know Him, but among them John says that He stands. Thus John continually pointed his hearers to Jesus. What good is it to preach and humble the whole world by calling them sinners and then leaving them in their poverty, misery, and damnation? He must also preach comfort and tell how we can get rid of our sins. This is done by pointing to Christ, who came to redeem us from our sins. Thus John preached, “Behold, the Lamb of God, who takes away the sin of the world.” He is how you get rid of your sins and in no other way. He alone takes upon Himself not just your sins, but the sins of the whole world. Not just some sins, but all the sins of the world, be they great or small, many or few. This is the message of comfort, that your sins are not yours anymore; they no longer lie on you, but they were taken by the Lamb of God. Innocent though He was, He was condemned for your sins and died for your sins. But He could not be held by sin and death. He rose from the dead, vanquishing sin and making it nothing. Likewise, death and hell, being the reward of sin, must be vanquished also. Sin naturally makes a conscience timid, which fears God and flees as Adam did in Paradise. Such a conscience knows that God is an enemy of sin and severely punishes it. Hence it flees and is afraid even to hear God mentioned. May God our Father according to His infinite mercy continue to send into the world and to us the voice of John who calls us to repentance and points us to Jesus as the Lamb of God who takes away our sins, freeing us to serve Him without fear, in holiness and righteousness before Him all our days (Luke 1:74-75). Amen. Dear people who will be visited by God: grace, mercy, and peace to you from God the Father and our Lord and Saviour Jesus Christ. Amen. We have heard of God’s visitation of old and His visitation now, and how His visitation of unbelievers is Law and judgment, but how His visitation of believers is Gospel and forgiveness. Today, we look to the future. We look to how God will visit us in the time yet to come. Judgment Day will be the final visitation of God. After Judgment Day, you will either be forever with God and in His presence, or you will be cast out of His presence, never to be visited by Him again. As with God’s visitation of old and His visitation now, everything depends entirely on faith. Just as God visited the unbelieving Egyptians with plague and death, and visits unbelievers who commune at His altar with judgment, so He will also finally visit all unbelievers with eternal judgment. And, just as God visited His people of Israel and saved them from slavery, and visits His people at His altar with forgiveness, so He will also finally visit all believers with eternal life. This passage beautifully brings together the past, the present, and the future of God’s children. Because in the past God predestined you and chose you for Himself, and because He has called you to faith and declares you justified in the present, you know that He will glorify you and grant you eternal life in the future. Put in another way, because God has graciously visited you in the past and graciously visits you in the present, you know He will graciously visit you on the Last Day. Notice how Scripture speaks of your glorification in the past tense. It doesn’t say, “those whom He justified He will also glorify.” It says, “those whom He justified He also glorified.” Because it is God’s promise to you, it can be stated so certainly like it has already taken place, as if you have already been raised from the dead and given a glorified, resurrected body. This is what Zechariah’s prophecy also does. At the time Zechariah uttered the prophecy, Jesus was not yet born. Mary was three months pregnant with Jesus. But what does Zechariah say? He says, filled with the Holy Spirit, “Blessed be the Lord God of Israel, for He has visited and redeemed His people.” When God makes a promise to do something, it is as good as done. Because God had promised to send a Saviour, even though He hadn’t yet died for our sins on the cross to save us and was not yet even born, Zechariah says that He has redeemed His people. He has saved us from the hand of our enemies and delivered us from the hand of all who hate us. That is how you should view God’s promises to you – that they are as certain as if they had already been fulfilled. Even though at this time you remain in this world of illness and suffering you have been delivered from your enemy of death. Even though you still struggle with sin, you have been saved from sin. Even though you are still tempted by the devil, you have been delivered from his clutches. And you have God’s promise that for those who love God all things work together for good. Your eternal good in heaven is what God wants for you. To make sure that you will make it there, God has visited you, claimed you as His own, and given you faith. He visits you in His Word and the Sacrament of the Altar to keep and preserve you in the faith. God visits His children with discipline now so that He will not visit us with punishment on Judgment Day. Under discipline, it may seem as though we are forsaken by God, but that is precisely when He is loving and caring for us the most. Through hardship, the Holy Spirit quenches sinful desires and kills the flesh, to prepare us for eternal life. Do not become bitter at God when He disciplines you. Rather, humble yourself and repent. Confess your sins and receive absolution. Even when God is visiting you with discipline, He also visits you with forgiveness. Even when God disciplines you He wants you to remember His promises to you. All things work together for your good. God has visited you and redeemed you. He continues to visit you with discipline and forgiveness so that when He visits you on the Last Day you will enter into the eternal joys of heaven with a glorified body. God’s promises to you are as certain as if they had already been fulfilled. Therefore we do not fear the return of Christ. Rather, we pray: O Saviour, rend the heavens wide; Come down, come down with mighty stride; Unlock the gates, the doors break down; Unbar the way to heaven’s crown (LSB 355 st. 1). Amen. Dear people who have good news preached to you: grace, mercy, and peace to you from God the Father and our Lord and Saviour Jesus Christ. Amen. Our expectations of Jesus often miss the mark. We are often tempted to ask Jesus, “Are you the one who is to come, or shall we look for another?” He doesn’t always do what we expect Him to do, even when we think it is obvious what He should do. God’s thoughts are not our thoughts, and His ways are not our ways (Is. 55:8). John the Baptist sent his disciples to ask Jesus that question, “Are you the one who is to come, or shall we look for another?” John was in prison for preaching repentance. He was in prison because he had been preparing the way of the Lord as sent by the Lord. If Jesus is truly the promised Saviour, surely He would rescue John from prison, right? But God’s thoughts are not our thoughts, and His ways are not our ways. John was only the forerunner. His task of preparing the way of the Lord was completed. As Jesus started His public ministry and was performing miracles and the crowds were going to hear Him preach, it was time for John to decrease. It was time for John to stop baptizing and for Jesus’ disciples to start baptizing. It was time for John’s disciples to become disciples of Jesus. John ending up in prison was part of him decreasing, but it was a tough pill to swallow. Surely Jesus could have just let him go retire on some Mediterranean island, but that was not His plan for John. His plan was for John to end up in prison until he was beheaded by Herod the tetrarch. “Are you the one who is to come, or shall we look for another?” Jesus answers John’s question in two ways. First, by His works, and second, by His words. He did the same thing when the Jews surrounded Him in the Temple and said to Him, “If you are the Christ, tell us plainly.” (Jn 10:24) Jesus responded to them, “I told you, and you do not believe. The works that I do in my Father’s name bear witness about me… even though you do not believe me, believe the works.” (Jn 10:25,38) Jesus speaks God’s truth and His works prove that He is the Christ promised by the mouth of the prophets. See what God spoke by the prophets concerning the Saviour, and see that they are fulfilled in Jesus. Jesus’ words and deeds prove to John’s disciples that He is the promised Messiah, the very Lamb of God that takes away the sin of the world. John never did the miraculous signs and wonders Jesus was doing. Neither did anyone else. Further, these signs and miracles were foretold by the prophets. Therefore when they saw these signs that the prophets had foretold, they could be assured that Jesus is the one who is to come and that there is no sense looking for another. The Jews, even today, look for another. Jesus is not what they expected, so they rejected Him and they reject Him still. They are offended by Jesus, so they still wait for a saviour (except of course for those Jews who have given up waiting altogether and expect no saviour to ever come). All the promises of God are founded on Christ who preached good news to the poor. Without Christ you have no promises of God and you have no fulfilment of prophecy. It is therefore in vain if anyone, like the Jews, expects the fulfilment of divine prophecy without Christ. Christ is the fulfilment, and all of God’s promises are only through Him. Only He has good news for the poor. In fact, Christ’s preaching of good news to the poor is the most important of the promises of God as foretold by the prophets. The blind receiving their sight, the lame walking, the lepers being cleansed, and the deaf hearing are all insignificant deeds compared with preaching good news to the poor. Those filled with pride and self-conceit will disagree. Those who do not understand the wickedness of their own hearts or how great their sins are don’t care for the preaching of the Gospel. They only want healing in this life and care nothing for eternity. They want comfort and pleasure in this life and do not want to hear that they are spiritually poor children of God’s wrath and deserving hell. However, those whose hard hearts have been crushed by the Law desire nothing more than to hear good news preached to them. Their pride and self-conceit has been crushed by God’s Law. They don’t look to themselves to save themselves from their sins. They know it would be futile. They look to and see Jesus, the promised Saviour, the Lamb of God who takes away the sin of the world. They hear the good news that their sins were put on the Lamb of God who was led to the slaughter without complaint. They hear the good news of the undeserved promise of eternal life. They would rather be blind, lame, leprous, and deaf than have the good news taken away from them. What more joyful tidings could a poor sorrowful heart hear than his sins are forgiven, his conscience is at rest, the Law is fulfilled, and at last eternal life is granted to him as his inheritance? Such a heart cannot stay sorrowful and troubled. Sin, death, hell, the world and the devil are scorned, derided, and held in contempt. Joy fills such a heart because iniquity is forgiven and sins are covered by Jesus’ blood. This is the good news Jesus sent to John and that He sends to you. Jesus takes misguided expectations and gives His promises that exceed all expectation. If you want to know what to expect of Jesus, look to His promises. Jesus will never fail you. And blessed is the one who is not offended by Him. Amen. Dear people who are visited by God: grace, mercy, and peace to you from God the Father and our Lord and Saviour Jesus Christ. Amen. Last week we heard of God’s visitation of Old – how His visitation of unbelievers throughout history meant curse, suffering, plague, and death, but how His visitation of believers throughout history meant blessing, salvation, and life. Today, instead of looking back into history, we look to the present. We look to how God visits us now. After Judas had betrayed Jesus and killed himself, Peter quotes Psalm 109 verse eight, “Let another take his office.” Matthias was chosen to take his office. What is interesting, is that the word translated as “office” in English is the same word as “visitation” in both the Hebrew of the Psalm, and the Greek in which Peter cites it. The office or position to which Judas had been called, is an office of oversight or supervision, but it speaks specifically of the act of watching over with special reference to being present, of visitation. This makes sense, because it is through the office or position of His ministers that God visits His people. God sends His ministers to do His work, and through them, visits His people. Thus, Ephesians four tells us, “When [Christ] ascended to the highest place, He took captivity captive, He gave gifts to men… He Himself gave the apostles and the prophets and the evangelists and pastors and teachers, for bringing the saints to completion, for the work of ministry, for building up the body of Christ.” (Eph. 4:8,11) Christ gives pastors to His church to work in the church for the benefit of His people. Pastors continue the work that Christ started. Of course, it is Christ Himself who works through pastors. Thus Jesus says to His ministers, “He who hears you, hears me.” (Lk. 10:16) Pastors in themselves can do nothing. Indeed, Jesus says to all believers, “Apart from me you can do nothing.” (Jn 15:5) It is God who works through His Word. It is God alone who turns us away from our sins in repentance. It is God alone who creates faith. It is God alone who saves. Yet, God saves through the preaching of the Word. God saves through water with the Word. God uses these means to save. God uses these means of grace to visit His people, and He calls ministers to dispense these means of grace. As with God’s visitation of old, His visitation today can be for good or for ill, for blessing or for curse. For those who trust God’s Word, His Word is a blessing and the path to eternal life. For those who reject God’s Word, His Word is a curse and the path to eternal damnation. Jesus is speaking of the very same Word. His visitation by means of His Word means life for believers and judgment for unbelievers. His Word does not judge believers because they pass from death to life, but His Word does judge and condemn unbelievers. We see this also in the Lord’s Supper, where Christ visits us with His true body and blood. The same body and blood of Jesus can be received for forgiveness or for judgment. Whoever eats and drinks in an unworthy manner will be guilty concerning the body and blood of the Lord. Anyone who eats and drinks without discerning the body eats and drinks judgment on himself. We are therefore told to examine ourselves before partaking. You must examine yourself to see whether you are sorry for your sins, whether you plan with the help of the Holy Spirit to change your sinful life, and whether you believe in Jesus Christ and His words in the Sacrament. If you aren’t sorry for your sins, you receive the Lord’s Supper to your harm. If you have no intention of turning away from your sins but returning to them upon receiving the Sacrament, you receive the Lord’s Supper to your condemnation. If you do not believe in Jesus or you do not believe His Word that He truly gives you His body and blood to eat and drink for the forgiveness of sins, you eat and drink judgment on yourself. This once again serves to point out that the same visitation of God is a curse for unbelievers and a blessing for believers. For the faithful, God’s visitation is a Gospel event, but for the godless it is Law. This also serves to point out that faith alone saves. It is not a question of how many sins you have committed. It is not a question of how many sins you struggle with or how many times you have fallen into temptation. Faithful reception of Christ’s true body and blood means being sorry for your sin and desiring to do better, and believing that Jesus gives you His true body and blood to eat and drink for the forgiveness of your sins. Christ visits you humbly with forgiveness. He sends pastors to His church who are in the office of visitation, visiting you with His Word and His body and blood. Since faith alone saves, God has given you faith. He visited you by washing you in the waters of Holy Baptism, joining you to Himself. He visits you by speaking His Word to you through His ministers to call you to repentance and to strengthen you in the faith. He visits you in the Sacrament of the Altar where He nourishes you to life everlasting. God visits you in His Word and Sacrament. His visitation of you is not in wrath or anger, but forgiveness. He gives us His Word for this purpose. Christ also specifically instituted the Lord’s Supper for the very purpose of increasing and strengthening faith. If you are weak in faith and struggling with your sins, the Lord’s Supper is for you to give you forgiveness and strengthen you in your fight with temptation. As for all believers throughout history, God’s visitation of you means blessing, salvation, and life for you. Amen. Dear believers who cling to the Word of God: grace, mercy, and peace to you from God the Father and our Lord and Saviour Jesus Christ. Amen. Jesus says, “Heaven and earth will pass away, but my words will not pass away.” This heaven and earth are not eternal. They will not last. But God’s Word is eternal. It will last. Therefore, you have a choice of clinging to that which will pass away, or to that which will not pass away. You can cling to the mammon and treasures and pleasures of this life which will all be burned with fire, or you can cling to the Word of God which leads to eternal life. Clinging to that which will be destroyed by eternal fire means that you will be destroyed by eternal fire. Clinging to that which does not pass away means that you will be saved eternally. God’s Word is eternal. It has been proclaimed on the earth since the beginning. Adam was a preacher. So were Noah, Abraham, Isaac, and Jacob. The preaching of the Word has been since the beginning, and has always been the same: the preaching of repentance and the promise of the forgiveness of sins as a free gift. It has always been about turning away from idols, turning away from that which will pass away and holding fast to that which is eternal, to that which will not pass away. The first writing down of God’s Word that we have recorded in Scripture, is God Himself writing the Ten Commandments on stone tablets. Over the next thousand years, the rest of the Scriptures were written which we call the Old Testament. Our epistle lesson tells us, “For whatever was written in former days was written for our instruction, that through endurance and through the encouragement of the Scriptures we might have hope.” The Bible was given to us so that we would learn from it, and that we would have endurance, encouragement, and hope. After a period of silence which lasted four hundred years, God the Father sent His Son into the world. The Word became flesh. God again spoke, and the New Testament was written. The Old and New Testaments are God’s Word. Everything that is written down in them was inspired by God, so they are free from error. Second Peter 2 says, “no prophecy of Scripture comes from someone’s own interpretation. For no prophecy was ever produced by the will of man, but men spoke from God as they were carried along by the Holy Spirit.” (1:20-21) Everything that is written by men is subject to error. Because God is responsible for the words written in the Bible, it does not have errors. It cannot have errors, because God does not have errors or make errors. The Bible is perfect and reliable. The Bible is therefore the only authority by which the church, its teaching, and its teachers are to be judged. The church does not decide any point of doctrine. The church is to submit to the doctrine revealed by the Holy Spirit in the Bible. That’s why you cannot have votes on matters of doctrine. A church committee or council or convention or voter’s assembly cannot make decisions on matters of doctrine. A pastor cannot make decisions on matters of doctrine. The entire church must submit to God’s Word as the sole authority on all things spiritual. Scripture is God-breathed. This means that God is the source of Scripture. It is for teaching. This means it teaches us God’s doctrine. It is for reproof and correction. This means it calls us to repentance over our sin. It is for training in righteousness and equipping us for good works. This means that it teaches us that we are declared righteous by grace alone, through faith alone, on account of Christ alone, so that we would live a God-pleasing life. The main purpose of the Bible is not to be a book of rules and commands for us to follow. In fact, the first purpose of the Bible is to show us that we cannot follow the rules and commands God has given us. The second, and main purpose of the Bible is to tell us how Jesus died for our sins so that we have the promise of the forgiveness of sins. These are the two major divisions of the teaching in the Bible – Law and Gospel. Law and Gospel will never pass away. They are eternal. The Law of God is eternal because it is the will of God for us which is holy, and righteous, and good (Rom. 7:12). In eternity it will no longer accuse us because we will fulfil the Law perfectly in heaven. We will no longer sin. We will live according to the Law of God in thought, word, and deed. The Gospel is eternal because it is an enduring message of deliverance from evil (cf. Rev. 14:6). We will no longer need the Gospel because we will no longer need the forgiveness of sins, but its effect is eternal. Because of Jesus’ death for us, we will spend eternity in heaven with Him and see Him face to face. This is why even though heaven and earth will pass away, God’s Word will not pass away. His will for us remains forever and His promises to us remain forever. This eternal Word of God makes you wise for salvation through faith in Christ Jesus. This eternal Word of God gives you faith that Jesus is the Christ, the Son of God, and thus gives you life in His name. Cling to God’s Word which is eternal. God’s Word will bring you to eternal life because it tells you about Jesus, the Word made flesh. He joined our human race in order to take upon Himself the sin the kept us away from God. He removed it from us by bearing its penalty in Himself. 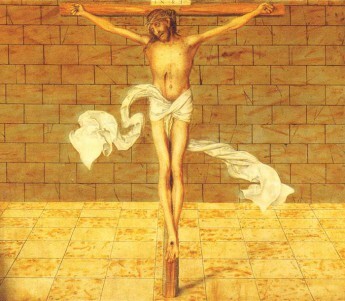 Christ crucified is the chief and main topic of the Bible as well as of the preached Word of God. He who created all things in the beginning and joined His creation in the fullness of time sends us His Holy Spirit, who daily and richly forgives us all our sins. This is how He keeps us united to Him in faith until the very end. This world will pass away, but the words of Jesus and those who cling to them in faith will endure forever. Amen. Times of God’s visitation are recorded in the pages of sacred Scripture. For the faithful, this visitation is a Gospel event. For unbelievers, it is Law. Joseph prophesied to his brothers that God would surely visit them in the land of Egypt and bring them out of Egypt to the land promised to Abraham, Isaac, and Jacob. God did indeed visit His people and He saved them. God’s visit meant that the Hebrews were freed from slavery and brought into a rich land flowing with milk and honey. God’s visit for the unbelieving Egyptians, however, meant that their water was turned into blood. God’s visit meant that they had plagues of frogs, gnats, flies, and locusts. Their livestock was struck dead, and the people were struck with plague. Hail killed man and beast and struck down every plant of the field and broke every tree of the field. Darkness enveloped their land and God struck down all the firstborn in all the land of Egypt. Finally, God drowned Pharaoh’s horses, his chariots, and his horsemen in the Red Sea. God’s visitation had dramatically different results for the Egyptians compared to the Israelites. For the Israelites, God’s visitation meant blessing, salvation, and life. For the Egyptians, God’s visitation meant curse, suffering, and death. The name “Jerusalem” means “city of peace,” but the people of Jerusalem did not recognize the Prince of Peace when He came. Jesus’ arrival in Jerusalem is the visitation of God that offered peace. Their rejection of Him would mean their destruction, just as Jesus lamented. Indeed, Jesus’ prophecy came true in the year 70 A.D. Jerusalem was besieged by four legions of the Roman army and conquered. The Temple was burned and destroyed. The historian Josephus records that the city was filled with slaughter. Even the peaceful citizens, the weak, and the unarmed were butchered wherever they were caught. A section of the wall surrounding Jerusalem was saved to show how well fortified the city was that the Romans had laid to waste. The rest of the wall was so thoroughly laid even with the ground by those who dug up its foundations that you could not tell the city had ever been inhabited. Josephus writes that 1.1 million people were killed during the siege, mostly Jews. The siege happened during Passover, when Jews had gathered from far and wide in Jerusalem to celebrate. Those who were not killed were sent to be gladiators in the arena. Others, including those under seventeen years old were sold into slavery. Another writer reports that Titus, the commander of the army and future Emperor, refused to accept a wreath of victory, saying that the victory did not come through his own efforts but that he had merely served as an instrument of divine wrath. Jesus wept because He knew this future. He knew that because they rejected His gracious visitation, they would have a visitation of wrath and punishment. Jesus loved the people of Jerusalem, but they did not love Him. They rejected Him. They mocked Him. They beat Him. They crucified Him. They did not know the things that make for peace. Yet, in their crucifixion of Jesus, peace was made. They did not know it, but peace was made between God and man. The punishment of the sins of mankind was put on Jesus. Because of Jesus’ death for us, not only do we escape punishment, but we are put into a positive relationship with God. We are at peace with Him. We are His dear children and He is our dear Father. The things that made for peace were Jesus’ suffering and death. God will visit us. His visit will be curse, suffering, and death for unbelievers. His visit will be blessing, salvation, and life for us. Not because we deserve blessing, salvation, and life, but because Jesus earned it for us. When will God visit us and give us every blessing? When will God visit us and right every wrong and end our suffering? When will God punish the wicked and save His children? We do not know. So, we wait for Him. We wait for Him in joyful anticipation because He will graciously visit us. God’s visitation in the person of His Son shows His disposition towards us. We know that He loves us to the point of sending His Son to suffer and die for us. Thus we know that when He visits us, He will visit with grace and mercy. He will visit us with a loving and forgiving heart. In repentant faith, we are ready for His visitation, whenever it will be. Amen.